India is home to 1.4 billion people – almost one-sixth of the world’s population – who belong to a variety of ethnicities and religions. 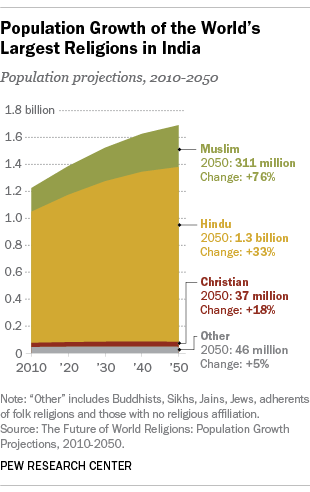 While 94% of the world’s Hindus live in India, there also are substantial populations of Muslims, Christians, Sikhs, Buddhists, Jains and adherents of folk religions. For most Indians, faith is important: In a 2015 Pew Research Center survey, eight-in-ten Indians said religion is very important in their lives. 1 India’s massive population includes not only the vast majority of the world’s Hindus, but also the second-largest group of Muslims within a single country, behind only Indonesia. By 2050, India’s Muslim population will grow to 311 million, making it the largest Muslim population in the world, according to Pew Research Center projections. Still, Indian Muslims are projected to remain a minority in their country, making up about 18% of the total population at midcentury, while Hindus figure to remain a majority (about 77%). 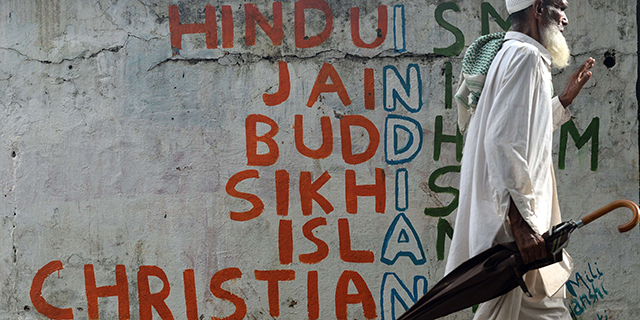 2India is a religiously pluralistic and multiethnic democracy – the largest in the world. Its constitution provides for freedom of conscience and the right to profess, practice and propagate religion. It has protections for minorities against discrimination on the grounds of religion or caste (a strict social stratification based on Hinduism). In 1976, the constitution was amended, officially making the country a secular state. At the same time, a directive in the constitution prohibits the slaughter of cows – an animal Hindus hold sacred – which each state has the authority to enforce. Currently, 21 out of 29 states have prison sentences for the act. 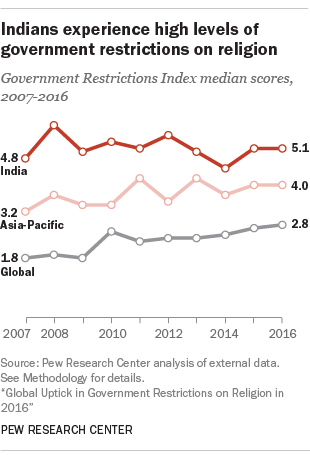 3 While there are legal protections for religious groups and minorities, Indians still generally experience “high” levels of government restrictions on religion, according to an annual Pew Research Center study. There are legal restrictions on religious conversions in at least six states that have at times been used to arrest and intimidate Muslims and Christians who proselytize, according to the U.S. Commission on International Religious Freedom. Additionally, Buddhists, Jains and Sikhs are legally considered Hindus and are unable to access social services or employment and educational preferences available to other religious minority groups. Meanwhile, Christians and Muslims who identify as low-caste Dalits – some of whom are descendants of Hindu Dalits who converted to escape caste discrimination – are restricted from accessing educational and employment benefits traditionally reserved for Hindu Dalits. Despite these restrictions, India’s Supreme Court has upheld protections for minorities in some religious freedom cases. 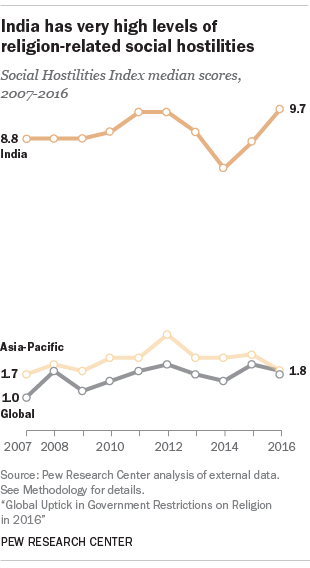 4 India also has experienced “very high” levels of religion-related social hostilities in the past decade, according to the same Pew Research Center study. In fact, since we began tracking this issue in 2007, the country has consistently scored “very high” on the study’s Social Hostilities Index. Much of the hostility is directed against low-caste Dalits, according to the U.S. State Department. Religious minorities, including Buddhists, Christians, Jains, Muslims and Sikhs, also are harassed. In recent years there has been a surge in mob attacks by Hindu vigilante groups against Dalit and Muslim consumers and traders in the beef, dairy and leather industries. Additionally, Dalit women are disproportionately victims of sexual violence due to their caste, while Muslim women and girls also have been targeted due to their religion. 5 Communal tensions – between Indians of various religious faiths and castes – have long plagued Indian society. Most Indians are at least somewhat concerned about these tensions, but even larger shares are worried about other national issues, according to a 2017 Pew Research Center survey. Almost four-in-ten Indians (37%) said “communal relations” are a very big problem in their country, while an additional 31% named this as a moderately big problem. But greater shares of Indian adults named crime, terrorism, corruption, lack of employment opportunities, rising prices and other issues as major national problems. Note: This is an update to a post published June 6, 2018.